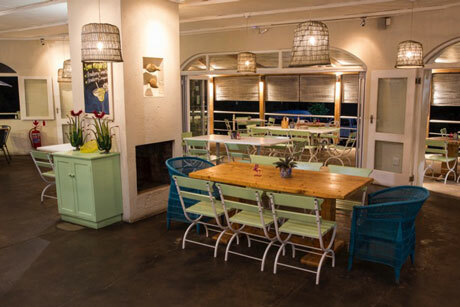 Picasso’s Mexican Taqueria opened in White River, Mpumalanga, in 2014 offering delicious, freshly-made Mexican food for breakfast, lunch and dinner, whilst you relax and take in the beautiful scenery and sip on one of our famous Margaritas or other unique cocktails. 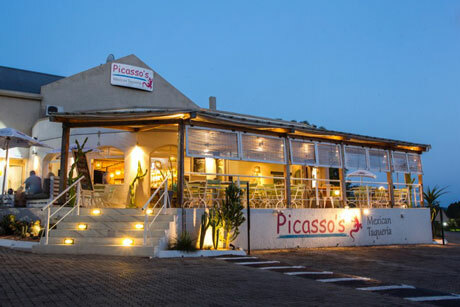 Picasso’s not only offers extraordinary Mexican food, but also an extraordinary experience whilst you enjoy a delicious meal and free Wi-Fi to boot. Our delicious range of Mexican food not only includes our taqueria’s scrumptious variety of taco fillings from our taco rack, but also nachos, chimichangas, fajitas, burritos, quesadillas and Mexican bowls to name a few! 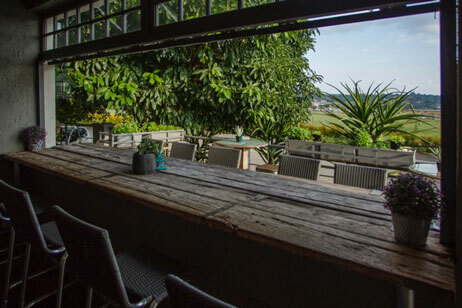 Numerous dishes – from our street chicken to pulled pork and lamb – is prepared in our wood-burning oven, ensuring a flavour that’s not only unique, but divine too! Have a look at our menu for our mouth-watering range of side orders and desserts, including our renowned churros. 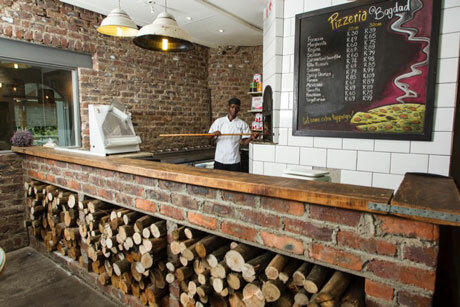 Our large pizza selection, made from tasty fresh ingredients before being placed into our wood-burning oven, make for a memorable meal for adults and kids alike. In addition, our new range of Mediterranean dishes will keep you coming back for more. 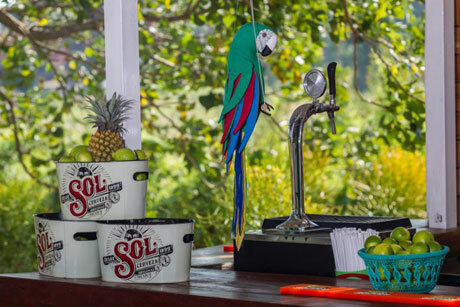 From our signature cocktail range, including the frozen Lime Margaritas and Strawberry Daiquiris that people come from far and wide just to taste, to Mexican Gold - an on-tap craft beer infused with tequila only available at Picasso’s and our vast range of tequilas and other drinks will leave you scratching your head wondering what to choose! 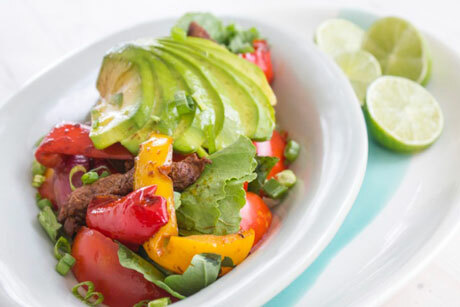 Craving our delicious food, but feeling like eating at home? Call us to place your takeaway order. 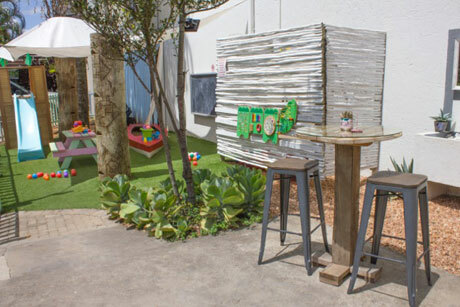 The same extraordinary experience that patrons have come to expect from Picasso’s Mexican Taqueria in White River is mobile and can now be enjoyed at events across Gauteng, White River and Nelspruit. 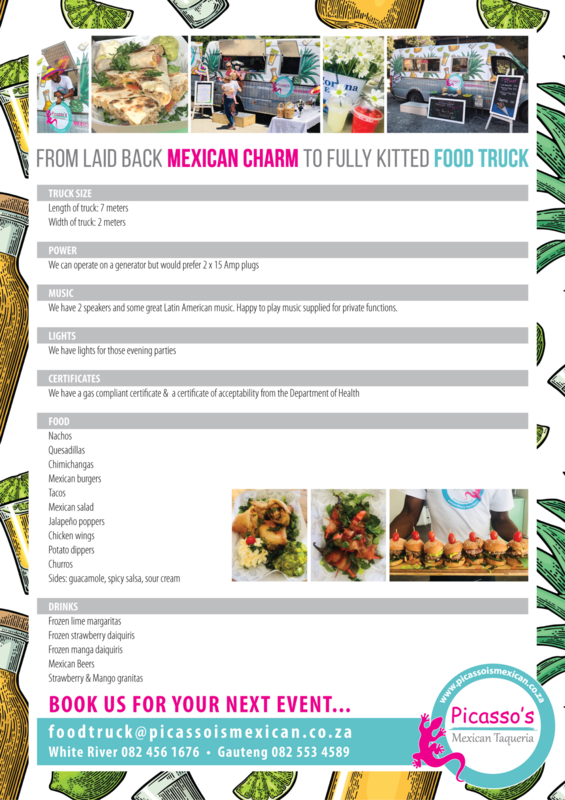 Mexican food is trending up a storm – mix that with the food truck craze, and you simply can’t go wrong! The fully-kitted Picasso’s Food Truck ticks both these boxes, and adds a dash of it’s own unique and delicious twist. 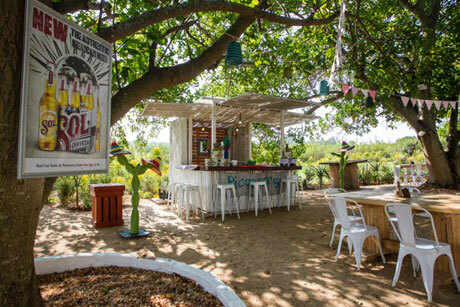 Available for festivals, functions, and private parties - including corporate events, birthdays, fundraisers, or any excuse for a large get together – we can add a flair of flavour. 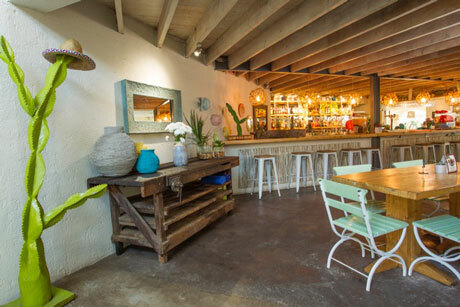 Picasso’s Mexican Taqueria is a 240-seater restaurant, offering various inside and outside areas to professionally host any function, from year-end and bachelorette parties to pre-wedding dinners and more. Contact us today for more information about how we can make your function memorable. Contact us now to make your booking, or for any other information about Picasso’s Mexican Taqueria.